This Radiant diamond is 1 carat in weight, and comes with Very Good polish and Good symmetry, as verified from an independent gemological laboratory. The diamond is graded E in colour, and has a clarity grade of VS1. The diamond's GIA grading report number is 14875067, which will detail further its specifications and measurements, and will also come with the purchase of the stone. AUD 40,616 Excl. Duties / Taxes. This Radiant diamond is 3.06 carat in weight, and comes with Very Good polish and Good symmetry, as verified from an independent gemological laboratory. The diamond is graded H in colour, and has a clarity grade of VS1. The diamond's GIA grading report number is 5161159808, which will detail further its specifications and measurements, and will also come with the purchase of the stone. AUD 3,587 Excl. Duties / Taxes. This Radiant diamond is 0.92 carat in weight, and comes with Fair polish and Fair symmetry, as verified from an independent gemological laboratory. The diamond is graded D in colour, and has a clarity grade of SI1. The diamond's GIA grading report number is 2185100945, which will detail further its specifications and measurements, and will also come with the purchase of the stone. AUD 15,028 Excl. Duties / Taxes. This Radiant diamond is 1.75 carat in weight, and comes with Excellent polish and Very Good symmetry, as verified from an independent gemological laboratory. The diamond is graded G in colour, and has a clarity grade of SI1. The diamond's GIA grading report number is 2203074383, which will detail further its specifications and measurements, and will also come with the purchase of the stone. AUD 28,361 Excl. Duties / Taxes. This Radiant diamond is 2.51 carat in weight, and comes with Excellent polish and Excellent symmetry, as verified from an independent gemological laboratory. The diamond is graded G in colour, and has a clarity grade of SI1. The diamond's GIA grading report number is 7321013799, which will detail further its specifications and measurements, and will also come with the purchase of the stone. AUD 1,00,445 Excl. Duties / Taxes. This Radiant diamond is 5.06 carat in weight, and comes with Excellent polish and Excellent symmetry, as verified from an independent gemological laboratory. The diamond is graded H in colour, and has a clarity grade of VS2. The diamond's GIA grading report number is 2191958730, which will detail further its specifications and measurements, and will also come with the purchase of the stone. AUD 12,979 Excl. Duties / Taxes. This Radiant diamond is 1.3 carat in weight, and comes with Excellent polish and Excellent symmetry, as verified from an independent gemological laboratory. The diamond is graded D in colour, and has a clarity grade of IF. The diamond's GIA grading report number is 6305997046, which will detail further its specifications and measurements, and will also come with the purchase of the stone. This Radiant diamond is 1 carat in weight, and comes with Excellent polish and Very Good symmetry, as verified from an independent gemological laboratory. The diamond is graded G in colour, and has a clarity grade of SI2. The diamond's GIA grading report number is 7271918817, which will detail further its specifications and measurements, and will also come with the purchase of the stone. AUD 20,042 Excl. Duties / Taxes. This Radiant diamond is 2.01 carat in weight, and comes with Excellent polish and Excellent symmetry, as verified from an independent gemological laboratory. The diamond is graded F in colour, and has a clarity grade of SI1. The diamond's GIA grading report number is 1295771512, which will detail further its specifications and measurements, and will also come with the purchase of the stone. AUD 20,353 Excl. Duties / Taxes. This Radiant diamond is 2.02 carat in weight, and comes with Excellent polish and Excellent symmetry, as verified from an independent gemological laboratory. The diamond is graded H in colour, and has a clarity grade of SI1. The diamond's GIA grading report number is 1278833194, which will detail further its specifications and measurements, and will also come with the purchase of the stone. AUD 46,168 Excl. Duties / Taxes. This Radiant diamond is 3.01 carat in weight, and comes with Very Good polish and Good symmetry, as verified from an independent gemological laboratory. The diamond is graded G in colour, and has a clarity grade of SI1. The diamond's GIA grading report number is 2276295596, which will detail further its specifications and measurements, and will also come with the purchase of the stone. AUD 10,656 Excl. Duties / Taxes. This Radiant diamond is 1.6 carat in weight, and comes with Very Good polish and Very Good symmetry, as verified from an independent gemological laboratory. The diamond is graded E in colour, and has a clarity grade of SI1. The diamond's GIA grading report number is 1328036664, which will detail further its specifications and measurements, and will also come with the purchase of the stone. AUD 18,729 Excl. Duties / Taxes. This Radiant diamond is 1.71 carat in weight, and comes with Very Good polish and Good symmetry, as verified from an independent gemological laboratory. The diamond is graded E in colour, and has a clarity grade of VS1. The diamond's GIA grading report number is 3155146087, which will detail further its specifications and measurements, and will also come with the purchase of the stone. AUD 23,712 Excl. Duties / Taxes. This Radiant diamond is 2.02 carat in weight, and comes with Excellent polish and Good symmetry, as verified from an independent gemological laboratory. The diamond is graded E in colour, and has a clarity grade of VS1. The diamond's GIA grading report number is 2141962594, which will detail further its specifications and measurements, and will also come with the purchase of the stone. AUD 3,963 Excl. Duties / Taxes. This Radiant diamond is 0.8 carat in weight, and comes with Good polish and Good symmetry, as verified from an independent gemological laboratory. The diamond is graded D in colour, and has a clarity grade of VS2. The diamond's GIA grading report number is 5306882212, which will detail further its specifications and measurements, and will also come with the purchase of the stone. AUD 2,980 Excl. Duties / Taxes. This Radiant diamond is 0.91 carat in weight, and comes with Very Good polish and Good symmetry, as verified from an independent gemological laboratory. The diamond is graded F in colour, and has a clarity grade of SI2. The diamond's GIA grading report number is 7323205406, which will detail further its specifications and measurements, and will also come with the purchase of the stone. AUD 3,614 Excl. Duties / Taxes. This Radiant diamond is 0.91 carat in weight, and comes with Good polish and Fair symmetry, as verified from an independent gemological laboratory. 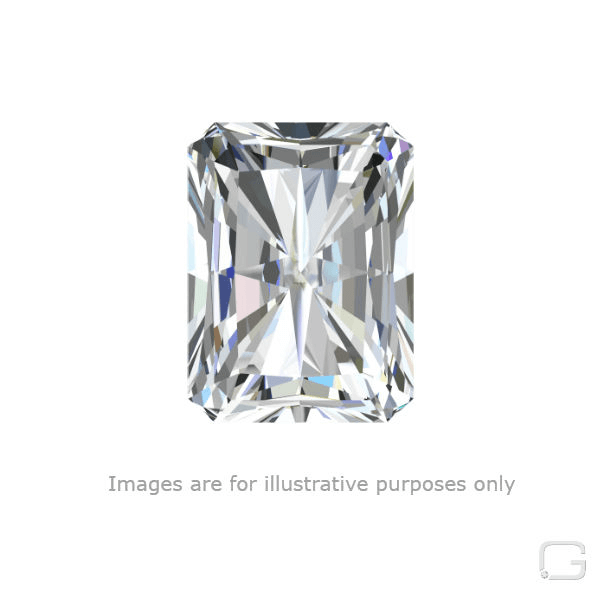 The diamond is graded G in colour, and has a clarity grade of SI2. The diamond's GIA grading report number is 5171473957, which will detail further its specifications and measurements, and will also come with the purchase of the stone. AUD 24,292 Excl. Duties / Taxes.